IT'S easy to forget in 2018 that all the mod cons we're so used to didn't exist. Cameras are now such a huge part of everyday life; imagine what a photographer had to deal with going to war over 100 years ago. Photography existed, but with primitive equipment and processes capturing any moment was difficult. News.com.au spoke with Matthew Butson, vice president of Getty Images' Hulton archive, which houses some of the oldest images ever captured, including these below of the Anzac's. "Photographers around this period worked with bulky glass plates - one photo per plate - so most photographers took no more than a dozen plates out with them in the field," he said. Compared to today's digital age, where thousands of shots can be taken every hour, this is quite remarkable and would explain why every shot is carefully composed and technically proficient", he added. Melanie Hough, Curator of the Getty Images Hulton Archive, explains some of the stories behind these rare ANZAC photos, shared with news.com.au. "While we don't know the names of the men pictured here, the photograph survives - continuing to tell their story, a testimony to their great resilience. While Australia will be joining the world in paying tribute to the Armistice centenary this Sunday, 11 November, the nation, along with New Zealand, has its traditional day of remembrance on 25th April. ANZAC Day marks the date that its troops first landed in Gallipolli during one of the most ill-fated campaigns of the WWI. In the only Ottoman victory of the conflict, over 56,000 Allied troops were killed, including 8,709 men from Australia and 2,721 from New Zealand. 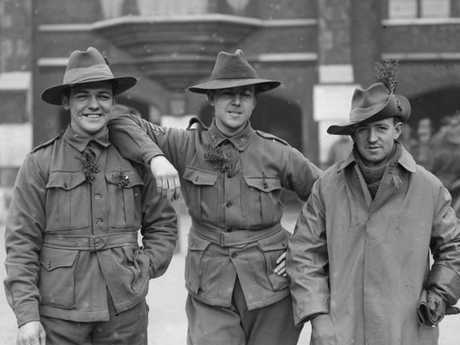 While it marked the last military triumph of the fading Empire, the stoicism and courage of the ANZAC forces created a sense of national character which has shaped modern Australia." 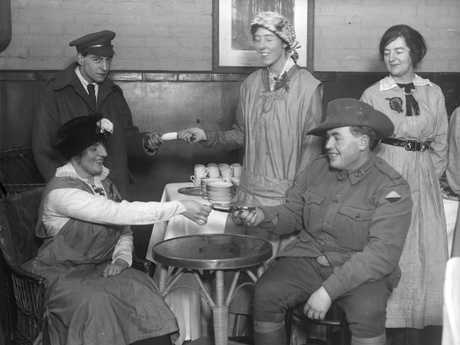 "The ANZAC Buffet was established by the London branch of the Australian Natives Association - an organisation of ex-patriot Australians - and opened in late 1915 to provide free meals and entertainment to Australian servicemen in London. 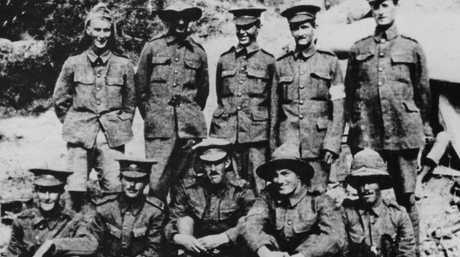 "At that time the bulk of the Australian forces were still in Egypt and Gallipoli and the Buffet would have catered more towards convalescing soldiers from the Gallipoli campaign, and a small number of Australians attached to units in France. "The Buffet was open seven days a week and early on host Mrs Rattigan ran the Buffet for two of those days a week, from 6am to 10.30pm. 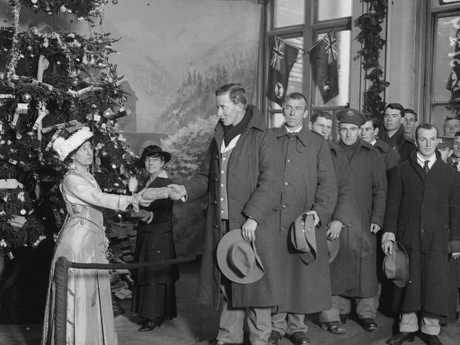 The staff at the Buffet generally fed and entertained 1,000 Australian servicemen a day. In addition to serving meals, the Anzac Buffet had billiard, reading and music rooms." "We hold the glass plate negatives of these images in our Archive, complete with the original handwritten captions. Feeling the weight in your hand - seeing the image surface - can be incredibly moving. "Even in these lighthearted images, no doubt intended to raise morale, one wonders what became of these young men and the women that made efforts to make them feel at home, in another hemisphere." 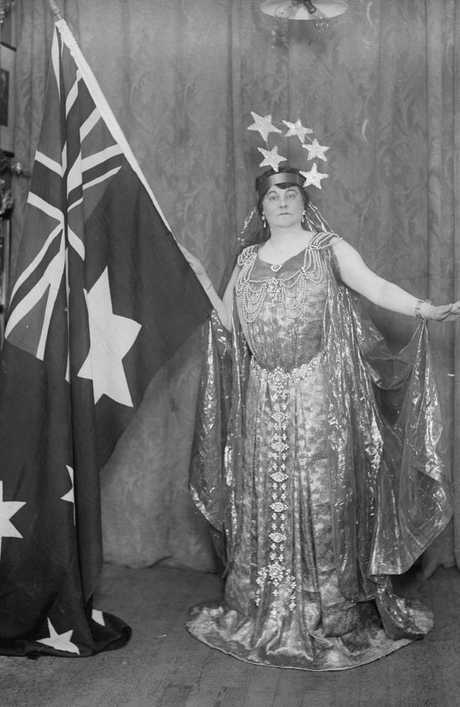 "Elsa Stralia, acclaimed for her "unusual breadth, power and feeling", spent the war years in the UK, with many of her performances at Drury Lane Theatre as part of the Royal Philharmonic Society, raising funds for the war effort. "The singer lost two brothers, killed in action." 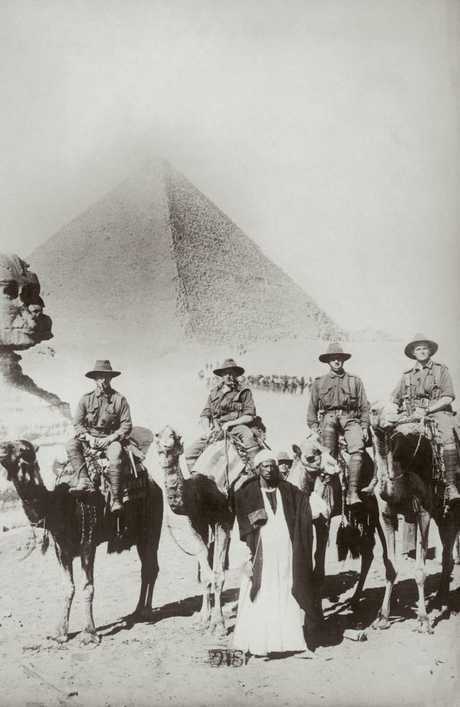 "The soldiers pictured here may very well have been part of the 1st Imperial Camel Corps Brigade, with two battalions of the four comprised of Australian troops who had survived the Battle of Gallipolli. "WWI was a transitional conflict, its warfare caught between the military practice of the 19th century against the first use of tanks and machine guns. Looking back at the pictures, it can seem absurd, that men were sent into battle on the back of a camel, armed with a Lewis gun. However, the Brigade saw a run of victories in Sinai, only disbanding when the terrain presented new challenges in Palestine." "While we remember those that did not make it home, the war to end all wars [WW1] left a resistant mark on its soldiers that shaped the century ahead. 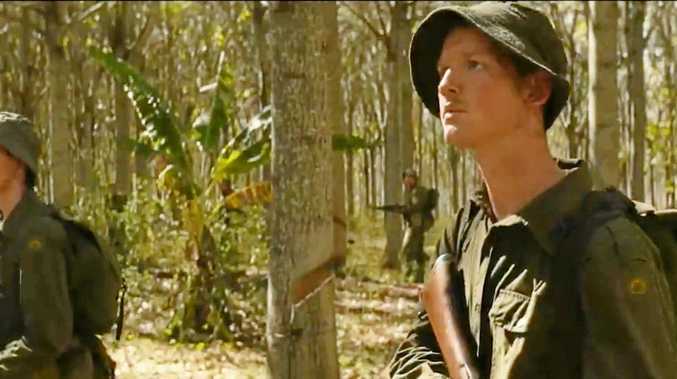 It's estimated that 156,000 Australian soldiers were physically injured in the conflict, with many returning soldiers dealing with immeasurable psychological trauma. "The nation at the time had a population of just five million people - in terms of casualties, it remains Australia's most devastating war." "When war was declared on 4 August 1914, Australia immediately pledged its support, along with other Commonwealth nations. Speaking in the days before the decision, Prime Minister Joseph Cook rallied, "Remember that when the Empire is at war, so is Australia at war [...] all our resources in Australia are in the Empire and for the Empire and for the preservation and security of the Empire". 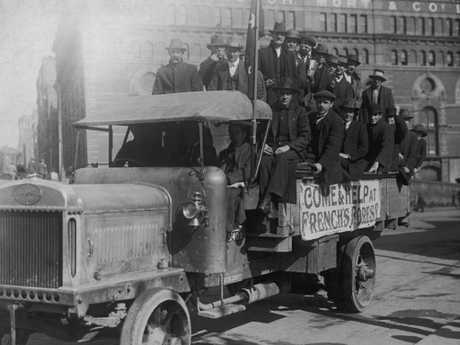 "One of only two nations not to enforce conscription, by the end of 1914 a total of 52,561 volunteers had passed the physical guidelines. 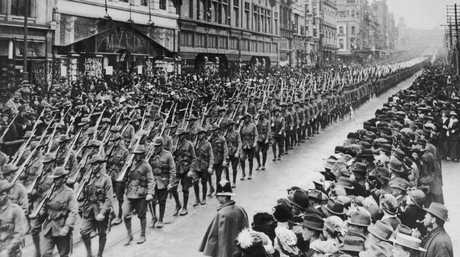 By November 1918, 60,000 Australians had lost their lives."